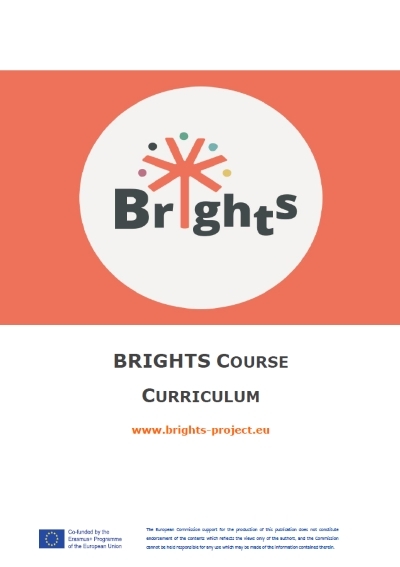 The BRIGHTS Course Curriculum is intended to provide information about the blended course “Addressing Global Citizenship Education through Digital Storytelling” which will be developed in the framework of the BRIGHTS project. The course will be delivered for the first time from February to June 2018 in four countries (Belgium, Italy, Croatia and Greece); this document describes in detail the structure of the training programme, as well as its methodology, learning objectives and learning outcomes. The aim of the BRIGHTS training course is to provide secondary school teachers and trainers working with young people aged 13-19 with a specific methodology to implement Global Citizenship Education using Digital Storytelling technique both in schools and in non-formal educational contexts. The course aims to respond to crucial training needs that are emerging among young people, such as intercultural and cross-cultural skills, critical thinking, collaborative and project-based learning, creativity and digital literacy. Face-to-face training: workshops (10 hours) to train selected teachers and trainers at local level, who will run hands-on workshops (25 hours) directly involving youngsters in the production of digital stories on global challenges including sustainable development and lifestyle, social inclusion and cultural diversity, gender equality, peace and human rights, active citizenship and democracy. The BRIGHTS Course Curriculum promotes training on cutting-edge topics in a constructive and participatory way. It has been designed to serve not only the course participants, but also members of the broader formal/non-formal education and training sector that are interested in Global Citizenship Education.